Currently has limited functionality. Rewrites coming. This data broker plugin provides easy access to tradeskills & tracked CDs (now stable, thanks to beta testers ). Supported languages: English, French, German, Chinese, Korean. Looking for Russian, Italian, Spanish, Latin American Spanish localizations! The first time you use this addon, you will have to scan for existing CDs, or craft them. Then, CD tracking will be automatic. - Added new crafting skill cooldowns (Tailoring, Blacksmithing, Leatherworking, Engineering). - Updated TOC for 5.4. - Added back in Lockpicking as a displayable skill on Rogues. Mostly fixes for MoP. Added in most of the new cooldowns. - Click to open the last selected tradeskill. - Right-click to access the config menu. - Click to open the tradeskill panel. - Shift+Click to link in chat. - Right-click to scan for CDs. - Middle-click to hide it from the list. - Click to craft; if it's cooling down, it opens the tradeskill panel and scroll to the CD instead. - Right-click to open the tradeskill window and scroll to the CD. - Control+click to set or remove an alias. - Middle-click to remove (only remove ready CD, unless you set the option to bypass this protection). - Right-Click to open the associated panel and scroll to it. - Filter tradeskills (2 filtering levels). - Track a particular profession. - Include ready CDs when scanning: by default, when you scan a profession, it only adds cooling down CDs. - Show only primary skills in the alt. tooltip (can be combined). - Show only professions that have a craft window (can be combined). - Display the number of ready CD (instead of the last selected tradeskill). - Edit signaletic colors (see below). - CDs belonging to an alt. - Orange entry is the tracked or last selected profession. - Yellow/gold entries have a panel and can be clicked. - Darker yellow/gold entries only provide information (they have no panel). - Yellow/gold entries are CDs owned by the current character. - Darker yellow/gold entries are CDs owned by your other characters. If you have AddonLoader, the loading of this addon will be delayed. If you have Skinner, this plugin will be automatically skinned. If you have ProfessionsBook, an entry to open it will be added to the list. Known bug: Broker display will show REAGENTS if the reagents are in your reagent bank, the item however is still craftable, looking for a fix now. Added a bug fix because I can't proofread! Couple of bug fixes added, thanks to user comments! Added new crafting skill cooldowns (Tailoring, Blacksmithing, Leatherworking, Engineering). Updated TOC for 5.4. German localization complete. Added back in Lockpicking as a displayable skill on Rogues. More updates to the cooldown tracking and timers. Added the Serpent's Heart. Minor update to the Magnificence cooldown group. Think this should work better. Well... I got a cooldown workaround working! Guess it took a few months, sorry about that. Still may be a bit of a problem with both of the leatherworking magnificence cooldowns going on CD once the other is (they should), so that needs some testing there, and I don't have a leatherworker at 90 yet. Also test the cooldown time reporting in general. It should work. Let me know what you guys think. Updated TOC, added in Lightning Steel and Magnificence cooldowns (The lightning steel I had already built, the Magnificence cooldowns, I hadn't -- thanks Griffin224), finished the shared group so that the cooldown for the scales and leather should show up. Has some minor debugging messages still in it, as I still haven't had time to finish and fix the cooldown code. It was still returning errors last I tried it in 5.1, but I haven't checked since and the issues may be fixed. I will try to revisit it soon. Please treat this as a beta. Some things won't work, but most of the cooldowns and shortcuts do. - Cooldown timing fixed up, either using Blizzard's native code if it's finally working or hacking a better method using some other addons' methods. 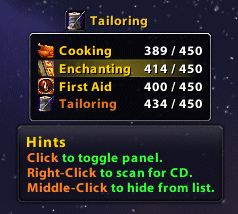 - Storage of cooking skills (This is a blizzard interface error as well). Minor update, added Living Steel to the transmute cooldown group. Haven't had time to look into displaying lockpicking on alt rogues or the minor checkmark issue in the config menu. -Fix for rogue detection in gender-specific languages, though at this time only German is implemented. Please test and let me know! - German localization and rogue detection localization complete (I think -- this needs to be tested and let me know if anything in the translation looks wrong). ToDo: Fix checkbox toggle when choosing skills to track, display Lockpicking on rogues in alt panel. I've quashed most of the bugs, and pretty sure I have a good system in-place to get herbalism back in the list for non-english locales -- please test this for me! - Added back in support to show Lockpicking for rogues, since I always forget and don't want to think about math in my game time (hah)! It can be toggled on or off as any skill. - Quashed a bug when selecting Runeforging or Lockpicking as the main tracked skill. - Clicking a skill to track it also clicks the checkbox next to tracking, which shouldn't happen. - More robust German localization. - Other localizations. Volunteers needed! Think I have almost everything originally listed fixed. I thought that called for a bump of the version number to match the version of the WoW client. - Fixed green boxes appearing in the config menu. - Fixed Herbalism and Fishing not appearing in list, and icon for fishing. - Added cooldowns (thanks for the assist in the groupname and icon, Uggers). - Fixed scanning in skills with subheaders. - If the error still occurs, please post relevant details. Not sure what I can do at this time if it is a localization issue). - Fixed disappearing professions for real (implemented GetProfessions). - Fixed tailoring CDs (dream of Ragnaros & Azshara). - Changed Fire Prism CD to 20 hours. - Removed cataclysm rare gem transmutes from CD list. - Fixed disappearing professions (@Goncyn: not using GetProfessions yet, for several reasons). - Added cataclym tradeskill CDs (not tested). - Changed Mysterious Egg / Disgusting Jar duration to 72 hours. - Fixed goblal functions to be local. - Fixed a graphical issue introduced with r38 (the highlight was covered by the alt list). - Fixed alchemy research to reset the 3rd midnight after the research. - Fixed a stupid mistake that was considering all cooldowns as not ready, thus preventing the craft action. - Long alt list now break into a second row instead of going out of screen. (Adjust automatically by default, but could be forced to break after the 5th character). - Fixed the craft all action (was closing panel immediatly). - Fixed tradeskill panel not showing when first opened externally. - Fixed German skill tracking. - Fixed: tooltip stuck on screen if after a ctrl+mousewheel the mouse was outside. - Fixed: alt mining skill shown as smelting. - Fixed: clicking on a non-ready cooldown wouldn't point to it if no panel was open at that time. - Fixed: clicking on a zero quantity shortcut wouldn't point to it if no panel was open at that time. - Added back alchemy transmutes for epic gems. - Added ctrl+mousewheel to change the tooltip scale. - Changed 20 hours CDs to "reset at midnight" CDs (not error proof if you're crafting in an instance). - Fixed alias dialog not showing if the config menu was not opened previously. - Fixed linking alt. professions in chat. - Fixed actions to properly highlight and scroll to recipes, keep panel visibility to the state it was before the action, unless the action requires the panel to stay open. - Fixed possible wrong placements of hints with a tooltip scale above or below 100%. - Fixed craft links not saving after the first one. - Removed alchemy CDs: gem transmute. - Changed background: more opaque. - Added the number of items you can craft on shortcuts. - Fixed the craft all functionality (shift+click or button 4/5). - If a cooldown has some missing reagents, "Reagents!" will be displayed instead of "Ready!". - Changed the default background a bit. - Tracking options are now handled like "Professions" and "Combat Skills" options: to toggle tracking, click the menu item; to select what to track, click a submenu item. - Added experimental "Auto" tracking. For now, the tracked profession will be automatically set on selection (secondary professions are also selectable in this mode). In the future, you may be able to control if it auto switch on skill up and/or selection. - Fixed a global variable that was causing some addon conflicts. - Fixed previous tracking errors (but I probably added fresh ones!). - Changed the scaling options to only affect clickable tooltips. - Removed unnecessary Skinner and SharedMedia optional dependencies, it was also creating Skinner problems. (Credits goes to Jncl). - Fixed the "Tooltip Size" > "Custom..." option. - Removed the DockingStation fix, it was affecting some non-DockingStation users. - Added CD: Glacial Bag. - Removed CDs: Ebonweave, Moonshroud, Spellweave, Smelt Titansteel. - Now usable even if flagged in combat. - Fixed the following issue: if an entry was removed, thus shortening the main tooltip enough for the mouse to be outside, thus hiding the main tooltip, the alt. tooltip was still visible. - To get around a DockingStation limitation(*) I had to make tooltips undetectable from it. The downside is this plugin won't benefits from the DockingStation's scaling option until that display is fixed. - Added a "Restore default colors" option. - Fixed a deDE translation. - Added support for MMOUI Minion in the TOC file. - Fixed an issue introduced with r30. It now saves correctly the icon and spell ID of your last transmute. - Added "Shift+Click to craft all" on shortcuts (also works with buttons 4-5). 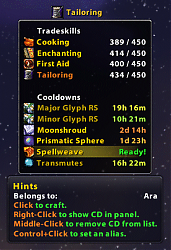 - Added an alt option to only show professions with a craft window (can be combined with "Primary only"). - Changed the config menu: alt options are now gathered in a submenu. - Updated zhTW translations (thanks to Launcelot). - Added an option to track a skill, displaying its value in real time. - Added "iconCoords" for LDB displays that handle it. - Removed Titanium transmute from CD list. - Fixed dead CD errors (like Titanium transmute). - Fixed the 2+ alchemists problem where only one transmute CD was visible. - Fixed a rare issue where the list may not hide properly if alts were hidden (is that correct grammar ?). - Fixed a minor issue where clicking the profession of an alt, and then clicking the same profession but from another alt, was closing the panel. - Fixed support for Disgusting Jar and Mysterious Egg (still untested!). - Added 6 alchemy transmute: Ametrine, Cardinal Ruby, Dreadstone, Eye of Zul, King's Amber and Majestic Zircon. - Added support for Disgusting Jar and Mysterious Egg (untested). Activate when one of these items is bought. - Fixed an error that war occuring for players with a primal mooncloth, shadowcloth and/or spellcloth in their list of CDs. - Fixed files not being in the addon folder. - Added support for ProfessionsBook. - Removed the useless "Force CD removal" option. Middle-clicking a CD will now always remove it. - Removed Primal Mooncloth, Shadowcloth and Spellcloth from the list of tracked CDs. - Changed the alt. skills tooltip to a clickable one. Open a character tradeskill panel to be able to access and link it from your other characters. - Changed the way tradeskills are sorted: primary skills are now on top of secondary skills. - Fixed a weird bug that was occuring for players with Skinner. - Removed the useless "Hide alt. skill names" option. - Fixed an issue with the number of ready CDs that could be off by one in some random cases. - Changed the integration of the "Click to create a shortcut." hint. It's now added to the main tooltip. - Added Korean (koKR) translations (courtesy of shwy73 and mrgyver). - Cafting a CD while in "x/y CDs" mode will now instantly refresh the display. - Changed the backdrop of the alt. tooltip to match the main tooltip. - Skinner now includes the alt. tooltip and refresh the skin at mouseover time instead of just applying it once at load time. - Fixed an error that occured on log out by removing the "ExpandSkillHeader(0)" line. - Fixed a logical error that occured when saving player skills for alts tooltip. - Removed a debug message left in r18. Im awake now ! - Fixed a display issue where the total number of CDs was including all transmutes. - Fixed an error where the Blizzard TradeSkillUI wasn't loaded when I was trying to modify it. - Fixed an issue where transmutes weren't properly showing that they were cooling down. - Shortcuts are now sorted (by skill then by name). - Added an option for alts to only display primary skills. - Added a "Shortcuts" section. You can add a shortcut to a craft by clicking its icon in the associated panel. - Updated the translations file along with frFR. - Added an option to remove alts from database. - Fixed display issues in CD mode (it was sometimes reverting to tradeskill names, or not updating icon). - Fixed the cooldown hint issue that occured right after a scan. It was showing "Click to show CD in panel" instead of "Click to craft" for ready CDs. - Fixed an issue where linking to chat wasn't properly linking when a tradeskill panel was open. - Added the ability to Shift+Click a tradeskill to link in chat. - Added an option to display the number of ready CD. 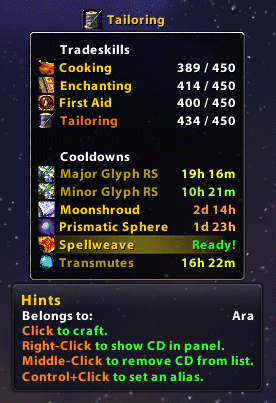 - Added a separate tooltip so you can see both alts & hints at the same time. - Removed a "collectgarbage" that could potentialy freeze your computer. - Code tweak / code cleanup. - Added a simple display for alt skills. - Changed the color formula curve from linear to inverse exponential to account for the difficulty of the last points (and easiness of the first ones). - This formula also fixed a color bug that occured when the difference between current and max value was over 75 (ie. 55/150), it was representing a greenish value instead of a reddish one. - Removed version checking that was necessary pre 3.0.8 to get the correct cooldown durations for titan-steel transmute and alchemy research. - Removed value colors from config since color coding does the job. - Fixed color coding (underestimated the problem :p). - Added color coding for tradeskill values (experimental). - Changed behavior for groups of CDs (like transmutes): click to cast the previous transmute used, right-click to show it in panel. - Translations: added zhTW, added partial deDE, updated frFR. - Fixed issues with cooldown icons (was retrieving spell icon instead of item icon, wasn't saving it properly in some cases). - Fixed an error with Cooking (was using the bad ID). - Added check marks to show/hide tradeskills and combat skills categories. - Added global handling of special cases where spell name doesnt match skill name (Smelting/Mining, german Kochen/Kochkunst, french Runeforge/Runeforger). - Fixed an error that occured when a CD was crafted before a scan can retrieve icons and names. - Fixed an error where no transmute icons were available at display time. - Added some strings to translate (see comments in "Translations.lua"). - Added support for SupplyAndDemand and ForkliftGnome (untested). Getting the following error the first time I open my tradeskill interface after logging in or reloading. Thanks. Just looked into that - The error is harmless, but the method that's causing it is completely hosed. Blizzard changed the TradeSkillUI code enough that it literally does nothing. Temporary fix (won't affect anything): Either delete the contents of the f:SetHooks method in Ara_Broker_Tradeskills.lua (it's right at the bottom of the file), or remove/comment line 1110 ("if f.SetHooks then f:SetHooks() end"). EDIT: You can just delete the entire method, it won't break anything. I'll see if I can find some time Soon(tm) to actually fix things up. Former author of EventHorizon Continued and Other Releases. Last edited by Taroven : 10-02-16 at 04:13 PM. Added the ability to donate! Still working on teaching myself LUA, hopefully will have it learned by the time I can afford Legion. Between summer stuff for three kids and the fact that my "job" called me to work and the other guy who was working with me quit I haven't had much time to do anything with this. Just want to apologize for the delay. (*temporary) = "attempt to index local 'b' (a nil value)"
First Aid = "First Aid"
I love this addon, I look forward to seeing it again on the top right of my Chocolate bar Your support is appreciated. Thanks for the amazing words of encouragment guys. Currently the addon is quite broken. It will most likely need a ground up re-write. I DO have a version that at least loads error free in 7.0.3. HOWEVER, it does not STAY error free. There is no cooldown tracking or crafting currently. It will however allow you to track all professions and open them by clicking on the name in the tooltip. Sorry for the big text, just wanted people to see it. Last edited by griffin224 : 07-26-16 at 10:09 AM. Best tradeskill addon around and nothing else comes close. Agreed! I've slogged through probably a half dozen tradeskills AddOns in the last few days since patch, nothing comes close to this one. Fingers crossed for an update to Legion! I second this, please update. Anyone able to update this? When you fold all of the List items in the TradeSkillListScrollFrame by using the "-" button as show in the screen shot, then the TradeSkillSkillIcon in the TradeSkillDetailScrollFrame holds no item and appears blank. Last edited by Mayron : 05-06-15 at 06:55 AM. one thing i always wished it could do, is "ignore" a certain character, instead of having to delete it each time it annoyed me to see it in the display (my banker has engineering just so i can use the auctioneer at the shrine, but i don't need to see his engineering data in the tooltip). Right click on the LDB display, there should be an option to not show a specific profession for the toon you are on (just remove the check mark). added fix for reagent bank and taint issue discussed here in comments. Updated TOC as well as adding Transmute: Savage Blood to the cooldown list.